Both Leon Camier and British Superbike Championship leader Shane Byrne said they want to recover from a disappointment round seven of the championship at Knockhill this weekend. Byrne scored his worst BSB weekend result at Oulton Park with two third place finishes and Leon Camier failed to start both races after a crash during qualifying at the Cheshire circuit. But for Byrne, who leads the title chase by 99 points from Cal Crutchlow, it was a gearing problem that cost him last time out – a problem he hopes to have resolved for this weekend. “I came away from the last round quite frustrated as I really wanted to get another win for the Airwaves Ducati team, but it’s made me more determined to kick up a gear and get back onto the top step of the podium,” said Byrne. “I’ve worked with my engineer on the gearing of my Airwaves Ducati 1098R so I’m confident we’ll have a good set up for the weekend. Camier on the other hand has had longer to concentrate on the Knockhill race weekend after sitting out race day at Oulton Park. The Kent rider, who turned twenty-two earlier this week, dropped to fifth in the championship after a non-points score in round seven. 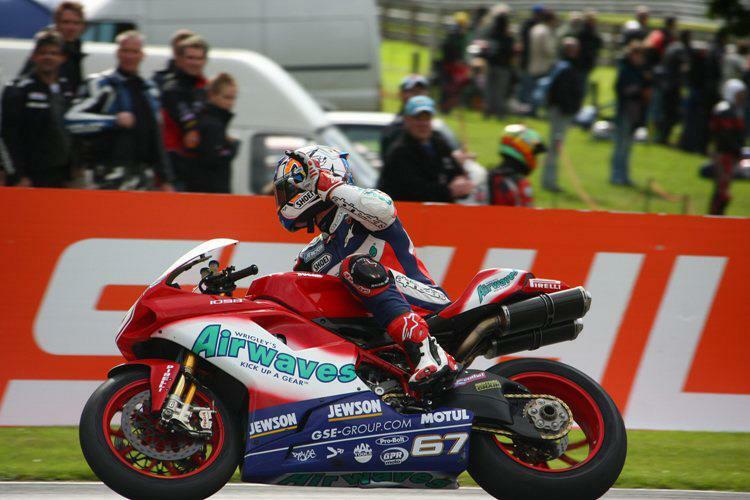 Camier said: “Oulton Park was a massive disappointment for me but since the moment we decided not to race, my focus has been on getting back aboard the Airwaves Ducati. “It’s been good to have a few weeks off to fully recover but I’m glad to be heading to Knockhill. “It’s a circuit that I am confident the Airwaves Ducati can perform well at.